Nothing beats a watermelon for Instant summer refreshment. My favourite ice cream as a kid was watermelon flavour and even now when I taste watermelon I'm transported back to summer holidays, sandy toes and blue skies. Here we've paired watermelon with aromatic rosemary for a more grown-up approach. Big on flavour, refreshment and all the summer vibes. Makes 10 ice pops, depending on the size of your mould. 600g watermelon flesh cubed & skin removed. 1. Pick the sprigs from the rosemary and discard the twig. Place the sugar, water and rosemary into a saucepan and bring to the boil. Once the sugar has dissolved take off the heat and allow to cool. 2. Removing the seeds of a watermelon by hand is a lengthy task so place the cubed watermelon into a food processor or blender and blend for 30 seconds or so to break down the flesh, the seeds will stay intact. Strain the flesh through a fine sieve to remove the seeds. Repeat if necessary. 3. Rinse the blender and return the watermelon juice, along with the strawberries and rosemary syrup, into a food processor or blender and blend until completely smooth. 4. Transfer the mix to a ziplock bag or baking tray that will fit in your freezer. Freeze for 4 to 5 hours until solid. 5. Break the frozen mixture into small pieces and place back into the blender/food processor. Blend for a couple of minutes to break down the ice, this will give the ice pops a smooth sorbet texture. 6. Pour or spoon the mix into popsicle moulds and top each with a popsicle stick. 7. Return the pops to the freezer for a further 5 hours or overnight. To remove the pops from the mould run the pops under a hot tap for 10 to 20 seconds and give them a good wiggle so they come out in one piece. If you don't have a popsicle mould, freeze the mixture in a 2 litre capacity Tupperware or a 2lb loaf tin and serve as scoops. Alternatively, you can use paper cups, I think cone cups for drinking water would make fabulous watermelon shaped moulds for these. If you have an ice cream churner omit the first freeze and place the mix directly into the churner once blended. Once churned transfer the mix into moulds and freeze until solid. 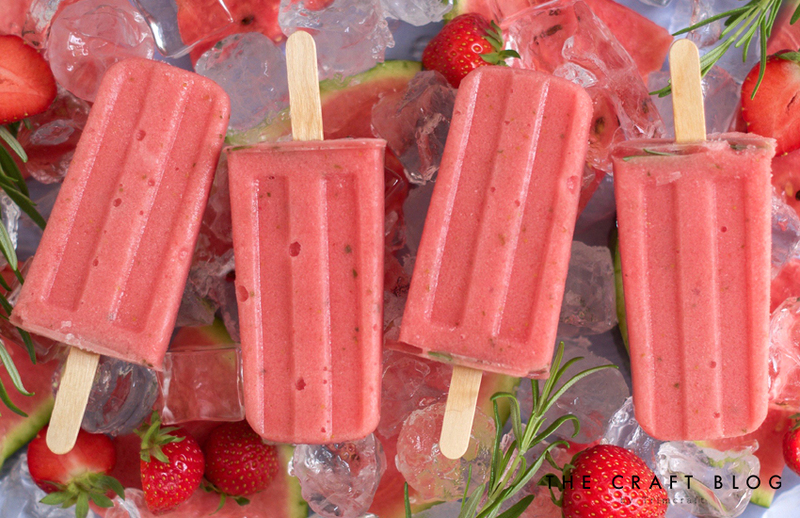 Will you be making your own melon and rosemary pops? They’re perfect for the hot weather that we’ve been seeing recently! We would love to see how you use Elle’s recipe so don’t forget to share your makes in the Inspiration area and to #Trimcraft when uploading to social media!